July 2015 – Got Hair Issues? I've Got Solutions. MONAT Goes to Canada in Two Days! To say we’re excited about welcoming Canada to our MONAT family is a HUGE understatement. And we are doing this before we’re even a year old! It’s because we’ve already achieved such incredible momentum that we are able to begin our global expansion so quickly. Who do you know in Canada that I can help step into a better life with our incredible opportunity? CONTACT ME TODAY so I can help get you on your way to this amazing income opportunity! Join Monat NOW! Get FREE Products! FLASH PROMOTION FOR NEW MARKET PARTNERS! This was a fun surprise to hear about on our company call last night. Join my MONAT team before tomorrow (Wednesday, July 29th, 2015) at midnight (Eastern time) and receive extra products for FREE! 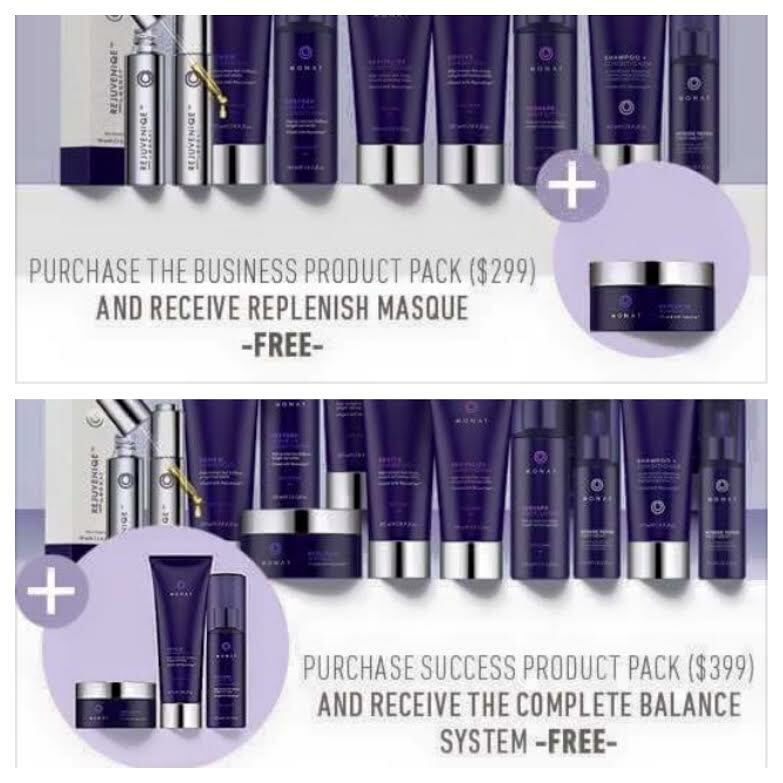 If you purchase the small product pack, get a FREE Masque ($50 retail value) OR purchase the large pack and get a FREE Balance Line ($99 retail value). Become a part of something that’s growing rapidly! We will be launching in Canada very soon so GLOBAL EXPANSION IS BEGINNING! Be a part of something very very exciting and life-changing for your family!! 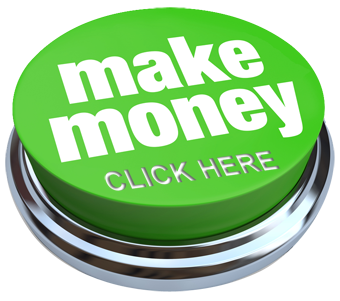 THE FOUNDING MEMBER (profit-sharing) OPPORTUNITY IS OVER IN TWO MONTHS and it’s NEVER coming back! DON’T GET LEFT BEHIND! Now that more people are hearing about and experiencing MONAT products, I sometimes get the question, what makes MONAT different than other nice hair product lines? I love when I hear this question because it gives me the opportunity to explain how and why we really are an innovative and cutting-edge concept! Sometimes people tell me “I can get really nice shampoos elsewhere” and while I do agree that the marketplace contains LOTS of options (the haircare industry is a $40 billion business after all – AND IT’S GROWING LIKE CRAZY), we are so much more than just a “nice shampoo”. Strengthens the hair anchoring system. This is one of the first improvements many people see after beginning one of our treatment systems. This means less hair clogging up your shower drain and more hair staying on your head. Promotes New Hair Growth. MONAT was not designed to be a hair-growing system, but what they found is that when hair follicles are cleaned out and nurtured properly (with high-quality vitamins, minerals, amino acids, etc. ), it brings their hair back to a healthy state and a wonderful side effect of that process is RE-GROWTH! MONAT is actually healthy food for your hair follicles! Fuller, Healthier, Younger-Looking Hair. Did you know that chemically-treating your hair (coloring, straightening, perming) can cause the hair to thin? It’s been shown that chemically-treated hair loses three times as much protein in water than natural hair, which contributes to weakness and dryness (and can also inhibit growth). We aren’t saying to stop coloring your hair but we DO say that MONAT products keep these types of results to a minimum. Gets Rid of Toxin Buildup. Dirt, oil and other environmental factors found in the air and in other hair and beauty products can coat and block the follicles in the scalp (can lead to hair loss). Our products put your hair through a “detox” period and help get rid of all this so the hair can actually breathe again and the follicles can do their job properly. Reduce Oxidative Stress. Your hair is subjected to stress and trauma from the sun and other environmental pollutants (chlorine from swimming is one example). Did you know that this ages your hair quicker? Our products protect your hair from UV and hair cell damage which actually slows down and can reverse the aging process. When we say we are an anti-aging product line, we really mean it! Moisturizes. For people with dry, brittle, and lifeless hair, MONAT products pump moisture back into even the thirstiest hair which gives hair the strength, vitality and shine that some people haven’t seen in a very long time. 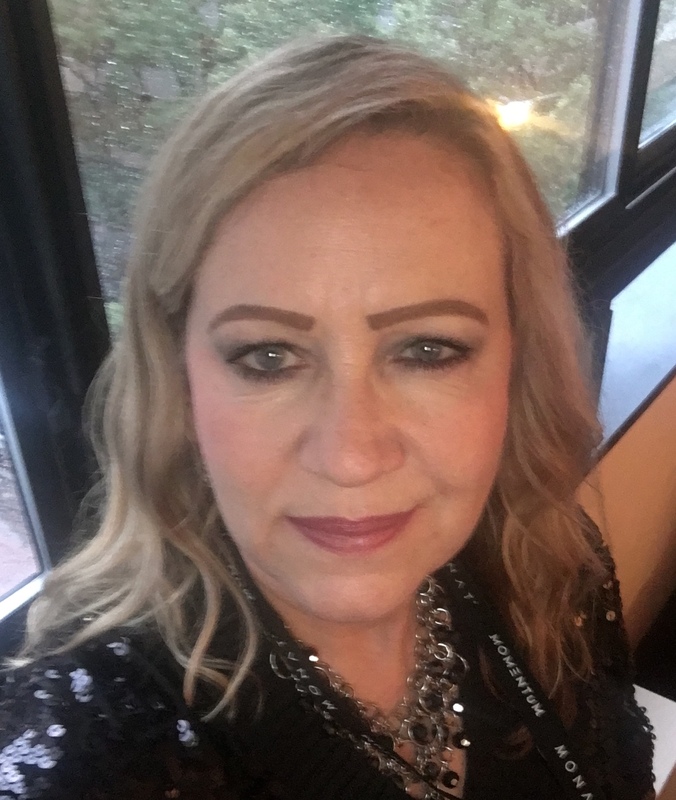 So, yes, I agree that there are lots of nice hair products on the market, now that I’ve been promoting MONAT long enough to see first-hand results (over a period of time) with my own hair as well as with my customers and other market partners, I can confidently say that we do have something unique and very special. MONAT is an 8-month old company and we are already having million dollar months in sales and are going to be pre-launching into Canada in August (yes we are already beginning our global growth)! If people were NOT getting these kinds of results with their hair, this type of growth just wouldn’t be happening!!! So MONAT is on to something pretty incredible here! I encourage everyone who has something about their hair that they don’t love, to give us a try. We have a 30-day money back guarantee so we do stand behind our products. And for you smart, business-minded people, the financial opportunity this company offers those who understand that joining a company when it’s in its first stage of incredible growth and growing with it, this is for YOU! The FOUNDING MEMBER opportunity door with MONAT is going to close soon! Don’t be that person that looks back and regrets that you didn’t at least ask about MONAT. ASK ME! I have a wonderful team of smart, business-minded people and I’m looking to grow in a few different areas. Maybe you’re in one of those areas. LET’S TALK! Contact Me Today!!! We hear all sorts of crazy ideas and recommendations on how to treat, style, wear, and care for our hair. In the end, it’s hard to discern what’s false from what’s true. Well, scientists, doctors, and hair care experts have set the record straight, revealing the reality behind the most common hair myths out there. Myth: The more you brush your hair, the more it will grow. Reality: Brushing your hair frequently does not stimulate blood flow to your scalp and does not distribute your natural oils, as you might have heard; nor will it add shine or boost hair growth. Brushing can actually cause cuticle damage, breakage, and frizz because of the friction. To prevent this, use a wide-toothed comb or a paddle brush with ball-tipped, plastic bristles. Myth: Rinsing your hair with cold water makes it shinier. Reality: Hair contains no living cells, so it doesn’t really react to cold -or hot- water. What makes hair shinier, softer, fuller or more manageable is actually the state of the scalp and hair and the quality of the products you use. Experts recommend using hair care products containing oils, for example, to close and smooth the cuticle of your hair. Thank goodness MONAT products are infused with REJUVENIQE™ Oil Intensive! Myth: The less you shampoo, the oilier your hair will be. Reality: Generally, genes and hormones determine the amount of oil your sebaceous glands will produce, no matter how often you wash your hair. 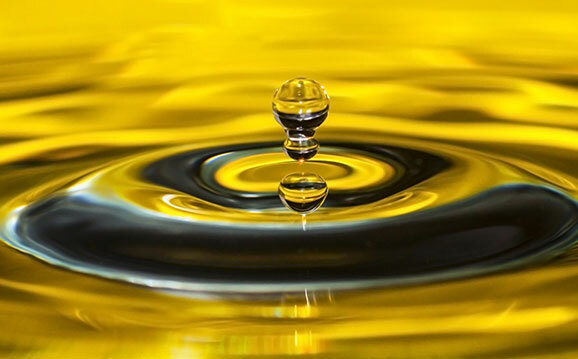 However, washing your hair excessively may cause it to compensate lost oils with an increase in oil production. On the other hand –and as with all extremes- not washing your hair regularly will cause dirt and oil to accumulate on your scalp and hair follicles, which could in turn cause inflammation and irritation that might halt hair growth. Myth: Using the same shampoo always will reduce its effectiveness. Reality: If you are using the right hair care products for your scalp and hair type, there’s no need to switch. MONAT Treatment Systems, for example, are specially formulated to actually improve the condition of your scalp and hair the more you use them! Myth: Trimming your hair frequently helps your hair grow faster. Reality: The state of your hair follicles and scalp is one of the factors that affects its growth process; how often you cut the ends of your hair is not! Whether you trim it or not, hair grows an average of a quarter-inch monthly. However, if you want to reduce hair breakage and split ends (which makes your hair look thinner and even shorter), do get regular trims with a professional stylist. I was recently asked what the pH level of MONAT products is so I thought I’d do a short post to let everyone know that our products have a pH level between 5 and 6. The pH level of human hair is between 4.5 and 5.5. Many products can disrupt the natural pH of the hair, but MONAT products are made to be closely aligned to your hair’s natural pH level. If you took a chemistry class in school, you’re probably familiar with pH (potential Hydrogen) levels. You’ve probably never thought about it, but pH levels are very important when it comes to maintaining healthy hair. If you wish to keep your color vibrant, boost the shine and retain overall health of your hair, it’s imperative to know how pH levels in shampoo and other hair products play a part in the overall process. 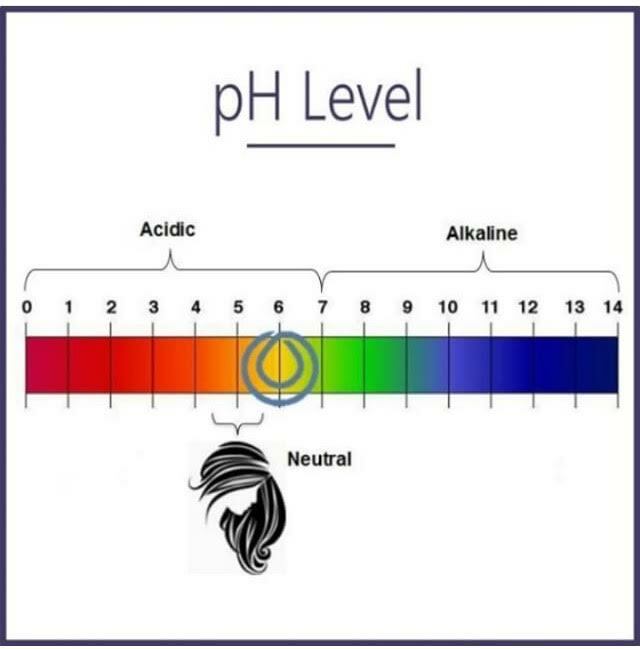 The pH scale ranges from 0 to 14 with 7 being “neutral”. The lower numbers are considered more acidic and the higher numbers are alkaline. The amount of hydrogen in a solution determines whether it is more acidic or alkaline. The higher the pH level the harder the shampoo is on your hair. The best pH level for shampoo is between 5 and 7. Your hair contains cuticles which are tiny shafts made up of scales. Water and alkaline-based hair products cause these scales to open, exposing the interior of your hair shafts. Ideally, you want to close this cuticle to protect it from harmful, damaging elements. Using a slightly acidic shampoo closes the cuticle and helps the hair shaft retain important moisture. When you dye your hair, the coloring products open up the cuticle so the color absorbs completely into the cortex (the interior of the hair shaft). To help prevent the hair from drying out, your scalp naturally produces oil with a slightly acidic pH in an effort to close the hair shafts. However, frequent coloring can result in your scalp producing too much oil, which will cause your hair to become greasy. A pH-balanced shampoo not only helps keep cuticles closed but prevents the scalp from producing too much oil after chemically-treating your hair. But even if you don’t color your hair, pH-balancing shampoos are crucial. If you have a naturally oily scalp, dry brittle ends or thin hair – pH-balanced shampoos can help reverse damage and give you the healthy hair you desire. MONAT’s Rejuveniqe Oil is a proprietary combination of 11 precious oils from around the world! I think it’s like liquid gold! It can be used in our hair, on our skin and many other different ways. 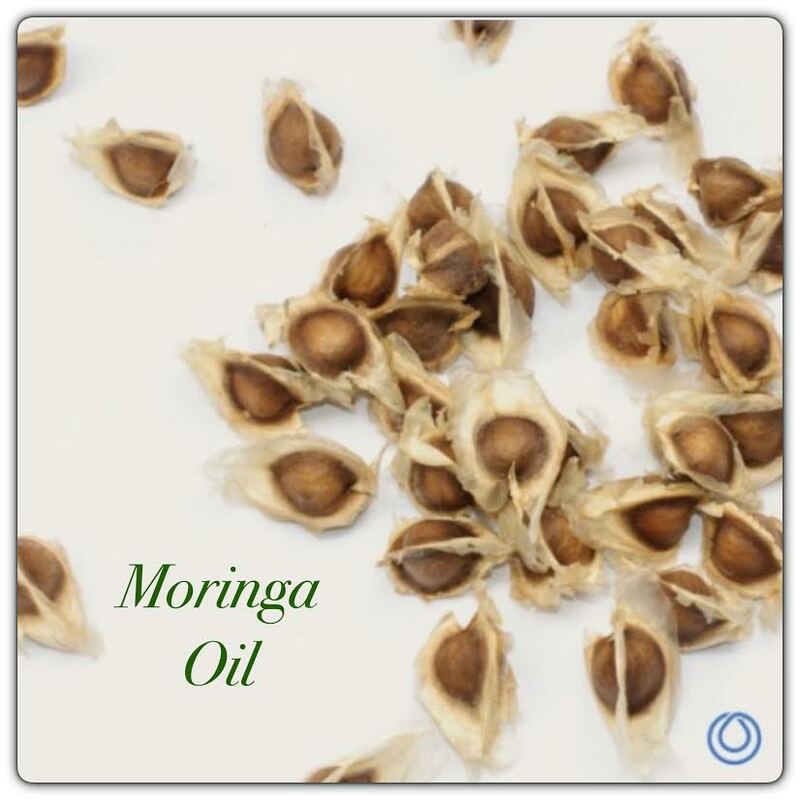 Moringa Oil is extracted from the seeds of Moringa Oleifera, also known as the Drumstick tree. Ancient Egyptians prized Moringa Oil for its nourishing properties. Its high Vitamins A and C and behenic acid content make it appropriate for use in body and hair care. Plus, the antioxidants and Vitamin E help combat skin fatigue and clean and purify the scalp. Rejuveniqe Oil combines Moringa with 10 other rare oils to make the best age prevention product on the market today. We get some great questions about our products so I thought it would be helpful to share a few of the most common ones. 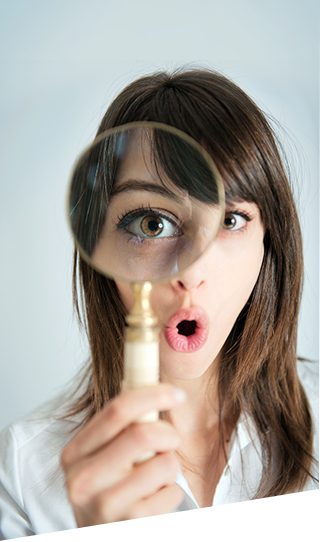 Q: Are your products non-comedogenic? A: Yes, our products are non-comedogenic which means that there are no pore-clogging ingredients that will cause the hair follicles to to shrink. In fact, our products are designed to unclog and enlarge follicles which in turn allows for better absorption of active ingredients that wake up hair growth. 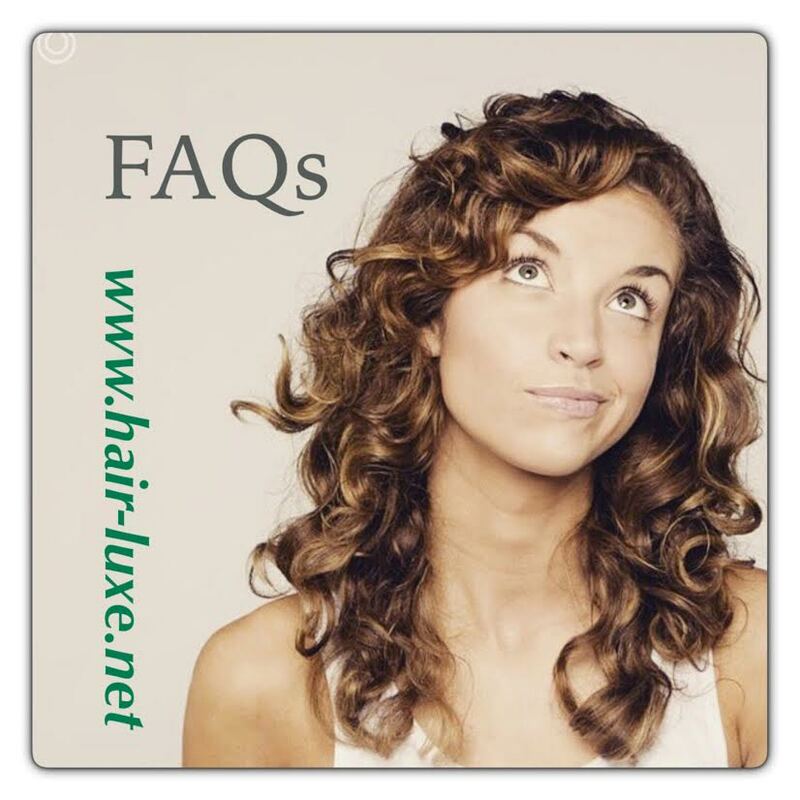 Q: Are your products hypoallergenic? A: We formulate our products without common allergens. Q: Are MONAT’s products tested on animals? A: MONAT does not conduct animal testing of any sort. We test on people, not cute little critters. Q: Are MONAT’s products safe for pregnant women? A: The ingredients in MONAT products are generally safe for pregnant women, but if she has concerns, she should talk to her OB/GYN or midwife about any ingredients that he/she thinks should be specifically avoided during pregnancy. Oh my goodness! The last couple of days have been one big, wonderful blur! 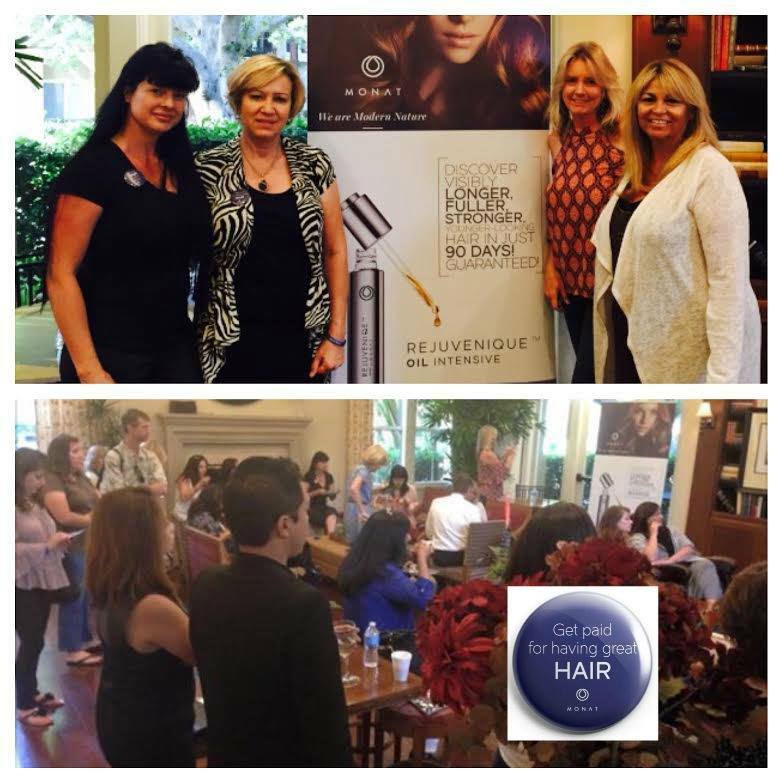 We had a packed house (standing room only) at our MONAT event last night in Newport Coast! Word is quickly getting out about our fast-growing, awesome company! I got home at 1:00 in the morning, got about 4 hours of sleep and from the time I woke up this morning I’ve hit the ground running! I’ve been on the phone answering questions, supporting my team, setting bigger goals, and adding a new lovely lady to my team! I’d say it’s been a very productive 48 hours! This is a photo of three of the beautiful ladies on my team (Lora, Sabrina and Doreen). Sabrina promoted to the next ranking level in June! Doreen is our hair stylist on the team and she’s got a large percentage of her clientele on our MONAT products! Lora Hobbs, on the very left, drove from Sacramento (8 hour drive) to be at this event! That’s what I call dedication and because she GETS IT! She understands what’s happening here! We are all over-the-moon excited about this opportunity that’s been given to us! I am looking to help 4-5 more serious people change their life with MONAT! Contact Me if you want to be a part of this!